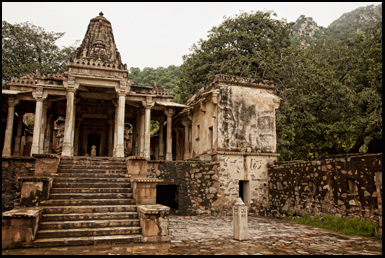 The supposedly haunted Bhangarh Fort is located deep in the jungle of the Rajasthan region of India. According to legend it was hurriedly abandoned in the 15th century and it is now said to be cursed. It is considered to be the most haunted place in India and restless spirits are rumored to wander its crumbling ruins. 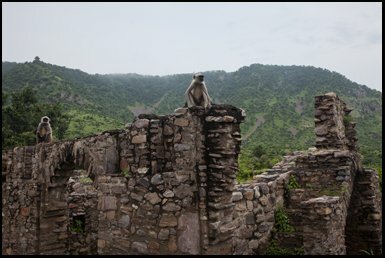 While an interest in the paranormal is not as widespread as in western country’s such as America and the U.K there are a few well known haunted places in India but the most famous by far is the haunted Bhangarh Fort. During my time in India I had already visited an old Colonial cemetery in the mountain city of Shimlah and there was also a haunted hotel I had planned to stay in. But unfortunately it was being refurbished so I was unable to do so. 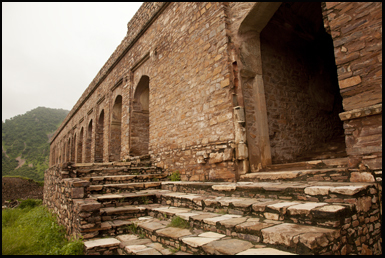 It was towards the end of my trip that I had scheduled a visit Bhangarh. I was now in Delhi and the fort was 150 miles South East. Although it was only 150 miles away this eventually meant I would spend 13 hours in a taxi. 4 hours there and due to hitting rush hour 9 hours back. There are few motorways’ in India, and once you get out of the main city’s much of the infrastructure is in primitive or in disrepair. Driving there is something I wouldn’t recommend but taxis are still fairly cheap. I found a driver that would take me to the fort and back for $160.00. Before I set off from the hotel in the center of Deli I collected my camera equipment, and made sure I took a map with the location of the fort that I had printed from the Internet. The taxi driver collected me at 9 am avoiding most of the rush hour traffic around that clogs the city. I was in India during the summer and although it was hot it was also during the monsoon season. I literally couldn’t remember a day in the last few months when it hadn’t rained. But even if it does rain, although it can be torrential it usually only lasts for a short space of time and the sky normally remains clear. Like the majority of people in India the taxi driver spoke fluent English. I showed him the map I had brought with me, but although he had never heard of the fort he did appear to know roughly where he should be headed. However this was not the case. As we got a few hours out of the city the roads become single track and you begin to head into the Jungle. Part of the route passes through a tiger reserve but there are few tigers left in it. However there are still plenty of other wild animals around from poisonous snakes, to panthers and elephants. But the ones you will see most are monkeys. They used to climb past the window of the hotel I was staying in a few weeks ago and guests were warned that they would occasionally get inside. But my closest encounter with them was the previous month when one of them stole the box of donuts I had bought from a road side vendor and then proceeded to eat them while looking down at me from on top of a nearby shed roof. Eventually the taxi driver left the main road and took a narrow turn-off that led up into the mountains. I hadn’t seen a house in about an hour and as we climbed, the jun gle spread out far below. There were also now dozens of wild peacocks running along side the car. As we got toward the top I started to realize that the pictures of the fort weren’t matching up with the building that was visible at the end of what was a dead end road. The entrance looked like it was closed but there were workman repairing a wall around the perimeter. I gave the taxi driver the map I had with me and they confirmed that this was the wrong place but they give him further directions and after another hour we were getting close to the haunted Bhangarh Fort. As we got farther away from Delhi the more desolate the surroundings became. Other cars were few and far between but occasionally you would get primitive villages along the sides of the road composed of a few makeshift wooden stalls that sold food and a couple of one story houses with straw roofs that were little more then shacks. We again headed off the main road and down a single track lane which was uneven and cracked making for a very bumpy ride. It was at that moment that the monsoon rain came and the driver had to slow down to a crawl as visibility was no more then a few feet. There was now a torrent of brown muddy water running down the side of the fields beside the road. The taxi suddenly came to a standstill as in front of us a bus packed with people had skidded over the side of the embankment, it looked like t he axle had broken off. It didn’t look like anyone had been injured so we carried on past it squeezing by on the opposite side of the road. Finally after a few more miles we came to another small village, the handful of houses there looked much older then the other ones I had seen along the way and they were made of stone. We drove up another hill and around the corner and finally we had arrived. The entire journey had something of an Indiana Jones feel to it so far and I hoped the fort wouldn’t disappoint. There were only a couple of other vehicles in the small car park by the gates. The rain had stopped completely and now it was fairly humid. One thing in India you will notice is that virtually all the cars are white. I’m not sure of the reason behind this; possibly it may be to reflect the heat. I gathered up my camera gear and headed into the remains of the fort. The entire area is surrounded by hills and jungle. And although it is very green, I have to remind myself that in these forests, unlike England, among all the other wildlife there are probably cobras, elephants and maybe even a few tigers. Although it is referred to as a fort it is actually the remains of an ancient city, which aside from barracks also had shops, temples and several palaces and at one time was home to over 10,000 people. The place is vast and looking over to both my extreme left and right towards the mountains there are ruins as far as the eye can see. There are only a few other people around and they appear to be Indians. Impressive as it is this is not a place that is on the main tourist trail as its not anywhere near any of the country’s major city’s and is difficult to get to which adds to its sense of isolation. 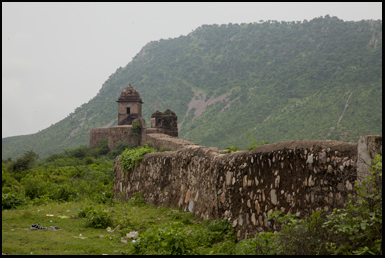 Aside from the ghosts there are a few legends associated with the haunted Bhangara Fort. One tells of a holy man by the name of Baba Balnath that granted permission for the fort to be built provided the buildings didn’t go over a certain height. Once the main palace was finished it towered over the city and cast a shadow over where the holy man lived. 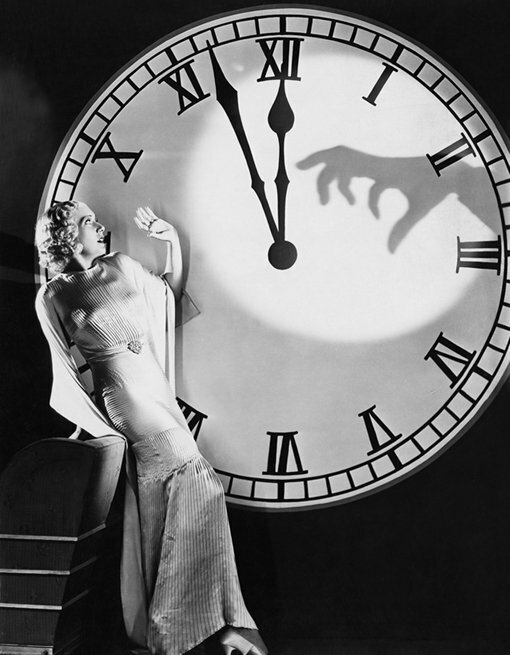 It was then that he put a curse on the town and he is said to still be buried somewhere on the grounds. The second legend is that of a wizard named Singhiya that tried to use his magic to trick the Princess of Bhangara into falling in love with him. She discovered his plan s and so he also cursed the city and now his restless spirit is said to still wander among the ruins. Once you pass through the main gates you make your way along a small pathway which has a few fast flowing streams cutting across it. There are about 50 baboons sitting on top of what remains of the walls of the first set of ruined buildings. The remains look like they were once single story dwellings. The shear vastness of the city reminds me of Pompeii in Italy which I visited several years ago which was buried under volcanic ash. The legends say that the fort is cursed, and it is forbidden by the government to stay here overnight because of the evil spirits. However if you do some research on the internet you will find that there are a few paranormal investigation groups in India that have done exactly that and their equipment and techniques are just the same as those used in the west. I can only think that on some obscure channel they show Ghost Hunters with Jason Hawes dubbed in Hindi, which probably makes him seem more articulate then when he speaks in English. While much of the city has crumbled it’s obvious that considerable preservation work is being undertaken so it doesn’t deteriorate further. Like any city aside from houses there were also shops, and further along the path the buildings begin to look more elaborate and some are two stories. But most of them no longer have roofs or ceilings. There is a long line of stone walls jutted out in front of me that used to be the main market place. To my left are a few twisted trees which are many hundreds of yea rs old. The path curves around so you can’t see the end of it. But as you start to walk further into the main part of the fort if you look behind you, you will see that below the ground is quite flat but above on three sides there are step hills. All the slopes are a burnt brown with little vegetation on them although up ahead as I walk out into the main part of the fort there is grass. On the right hand side there is a temple and straight ahead there are the massive ruins of what was the Royal palace just beyond what looks like medieval castle turrets. Religion obviously played a major part in the lives of the former inhabitants of the city. 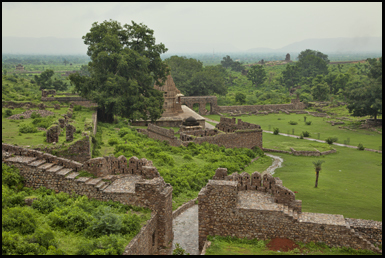 If you stand in the center of the grass courtyard and look around you, you can see the ruins of 5 different temples including the Hanuman Temple, Gopinath Temple, Someswar Temple, and Keshav Rai Temple. A few hundred yards on and I passed through the gap between the two turrets and started to climb the walkway. The thick wall that leads from one of them on the right hand side leads several hundred feet up the hill where there is a large stone watch tower with an ornate domed roof. Although the turrets are similar to those found in English castles the huge building ahead at the base of the mountains is of a far grander design. As I walk up the path and start to climb the steps to the first level you can see rows of still intact archways, this was once the palace where several hundred years ago Bhagwant Das ruled the city below him. The haunted Bhangara Fort really is set in a spectacular location, above you are the mountains and as you look back over the grounds of the fort you can see far into the distance and it is then that you realize how removed you are from the rest of the world. This cursed city really is India’s Temple of Doom. I head down a long dark stone hallway where despite the humidity it gets instantly colder. If you look out between the archways that face onto the grass courtyard, you can see the extent of the castle walls and the remains they surround. These are the same views that the city’s original inhabitants must have gazed upon over 500 years ago and the landscape has probably changed very little in that space of time. The first level of the palace is fairly intact, but if you climb up further to the very top it looks like the entire roof and walls have all collapsed in on themselves and huge blocks of stone and rubble cover the area just below the base of the mountains. With few other people in the fort, it is deathly quiet up here and, there are no distant sounds of traffic or people talking only a slight howl from the light breeze that rolls down the hill. It does make your wonder what it would be like to spend the night here and what sort of animals may make there way down after dark. But there must have been a very compelling reason for 10,000 people to suddenly desert such a spectacular location and leave it to be reclaimed by the jungle. 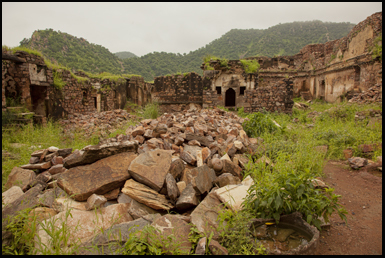 The other name that the haunted Bhangarh Fort is known by is Bhoot Bangla which means the fort of ghosts. Without doubt people’s attitude towards death in India are different from m ost westerners. I was standing in line waiting to get into the Taj Mahal a few days ago and a group of people passed by running along carrying what looked like a stretcher with a person on it. I asked my guide what it was and he explained it was a dead body on its way to be cremated on the banks of the Ganjas. 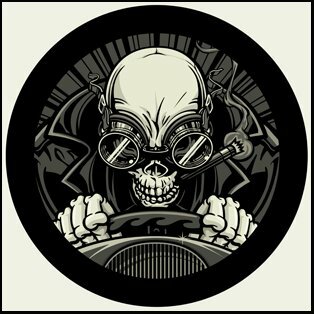 Death isn’t viewed as morbid or something to fear like it does elsewhere and maybe because of their spirituality Indians don’t seem to believe in the paranormal in the same way we do. I make my way back down the pathway at the front of the palace and head over to the other side of the grass courtyard and to the right. This is where the most spectacular of the forts temples is. In front of it is a large square man-made pond with a small waterfall running into it. This is know as the Temple of Somnath with the mountains behind it, it does look like a movie set. I walked up a series of large paved steps and took a few more pictures. On the roof of the temple there is what looks like a massive stone bell supported by large round pillars. Below that there is an altar with a few people gathered around it. From where I’m standing I can see some more ruins in the distance on the right hand side which are partially hidden beneath the undergrowth at the bottom the hill. In front of me is the main courtyard. The grass is surprisingly green considering how baron the surrounding mountains are, there a few trees and beyond the perimeter of the city walls there is a haze that has settled over the valley. It looks like there is a band of rain heading back this way and the sun is starting to set. Famously there is a sign at the entrance to the fort that says visitors are expressly forbidden by the government to spend the night here. This has been taken to mean it’s because of the ghosts. But I won’t be sticking around to find out as I have what turned out to be a 9 hour ride back to Deli. As I look out of the back window of the taxi to take a final glimpse of the ruined city, the light is fading fast and I can’t help but wonder if when darkness falls that the curse lives on and the forts lost inhabitants will be taking one last walk along its crumbling remains. Hey Buddy!, I found this information for you: "Haunted Bhangara Fort – India". Here is the website link: https://www.chasingmidnight.com/haunted-bhangara-fort-india. Thank you.